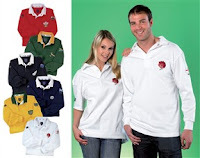 Rugby Supporter Shirt With FREE Short Sleeve Shirt. The ultimate rugby fashion shirt made from heavyweight 320g 100% cotton with fully embroidered club badge on the chest and country flag on the sleeve. And when you order this rugby shirt you get a corresponding short sleeve shirt absolutely FREE! available in England, Scotland, South Africa, Australia, Wales and New Zealand in sizes Small - XXLarge.